During an accident or braking manoeuvre, correctly worn seat belts hold the vehicle occupants in position in such a way as to provide maximum protection . Fasten seat belts before every trip. Always adjust the front seat and head restraint correctly . Engage the rear seat backrests in an upright position . Take hold of the latch plate and pull it evenly across your chest and pelvis. Do not twist the belt in the process . Insert the latch plate securely into the buckle belonging to the occupied seat . 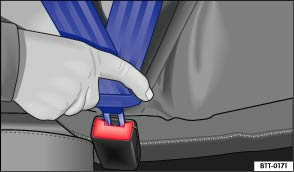 Pull on the seat belt to ensure that the latch plate is securely locked in the buckle. Unfasten seat belts only when the vehicle is stationary . Press the red button in the buckle . The latch plate is released and springs out. 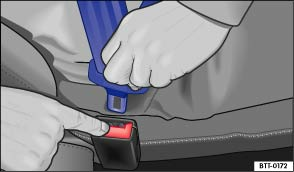 Guide the belt back by hand so that it rolls up easily, without twisting the seat belt and without damaging the trim. Incorrect seat belt routing can cause severe or fatal injuries in the event of an accident. The seat belts only offer best protection when the backrests are in an upright position and the seat belts have been fastened properly according to the occupant's height. Unfastening seat belts while the vehicle is in motion can lead to severe or fatal injuries in the event of an accident or sudden braking manoeuvre.